Pemba, a rehabilitated Olive ridley turtle, was released at Mabibi in KWaZulu-Natal on the 8th of March 2018. She wasted no time and literally jumped into the mighty Agulhas current straight away. This liquid conveyer belt moved her past Mosselbay by the 20th of March and she was south of Cape Town by the 24th of March. 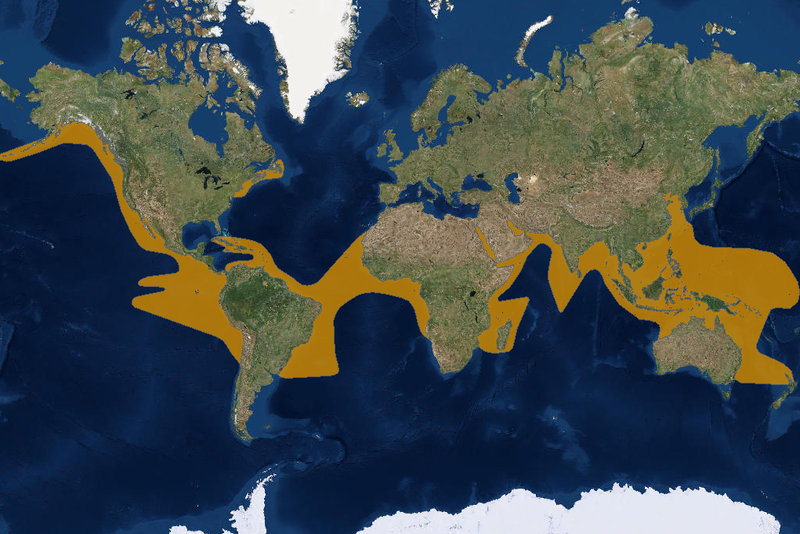 She then spent a month exploring the southern ocean and started heading up the west coast in May. She explored closely inshore, near Doringbaai, towards the end of May, before veering offshore. She crossed the Walvis ridge by the end of October and has since made her way across the Atlantic. She is currently 1906 kilometers west of the Namibian/Angolan border and 3515 kilometers east of Brazil. She has traveled more than 12 700 kilometers! 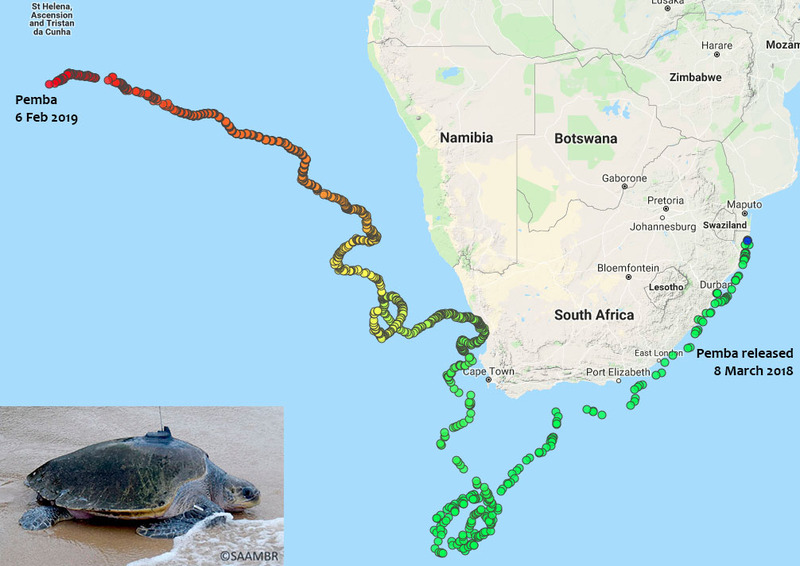 She has been back in the ocean for 333 days already and it sure looks like she is heading towards Brazil, where there are quite a few Olive Ridley nesting sites. She has a nice strong easterly wind behind her at the moment and I am sure she is loving the 25°C water she finds herself in. 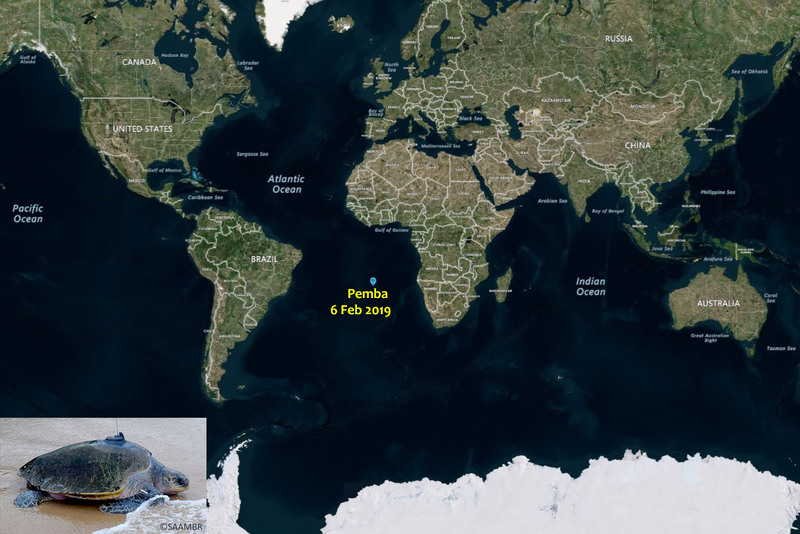 Pemba was a challenging medical case – and it is lovely to see her crossing oceans! Credit must go to the fantastic efforts by the veterinarian staff and turtle teams at both the Two Oceans Aquarium and uShaka Sea World.